After we dug out from our snowstorm last week, Brian, Maizie, Noodlebug and I safely made our annual trek to St. Petersburg Florida. 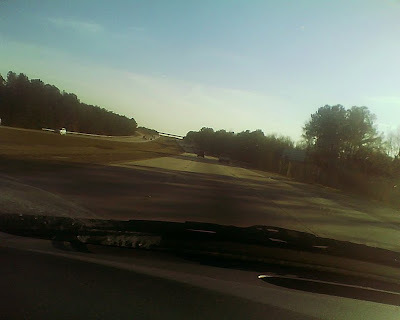 In addition to showing how dirty our windshield is, this photo I took sort of captures the sad, long December shadows on I-95 through the Carolinas. I always feel very melancholy at this point in the trip. I look forward to the Florida sun, but it is sad leaving everyone behind at home. Especially this year. My mom is staying behind to be with her dog, Eby, and has graciously (and bravely) taken on the horsekeeping of two giant Thoroughbreds, Pie and Sovereign. Brian made changes to the barn so that turnout of the boys would be “easier” but with the snow, and now mud, nothing is easy. Every report from my mom has been excellent about how the boys are behaving, but the weather has been simply awful. Our lovely pastures are nothing but mud because the snow melted so quickly. In addition, she has the daily stall cleaning and bucket scrubbing. When we return, we will take over Eby’s care and Mom will come down to Florida for a hero’s well-earned vacation. Staying in my family’s condo is like walking into a time machine. Everything is exactly as it was in 1973, when it was built. It is so much fun. 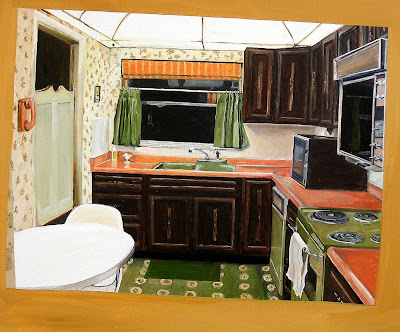 Here is a painting I did of the kitchen. The counters really are orange. The appliances really are avocado. There is a dome light ceiling. We love the contrast from our English cottage lifestyle at home. The most magnificent part of our vacation is the back porch. The condo is on an intercoastal waterway. We have a dock and a back porch that is warm and private and has an island bird sanctuary directly across from us. We spend most of our time out there reading and playing games and just soaking in the sun. Dolphins often swim up! We haven’t taken Maizie to Disney or any place like that. The condo is part of a retirement community. Maizie really gets on well with all the elderly people. We play shuffleboard, tennis, bocce ball and we use the putting green. We bike to the grocery store, library and beach. To us it is idyllic, but I am sure it would be boring to other people! 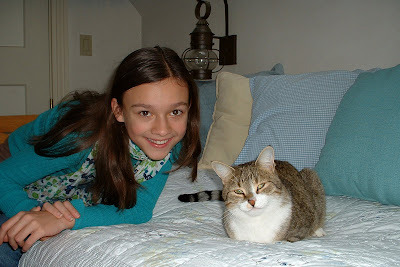 Here is a photo of Maizie and Noodlebug taken right before we left. I love both of them so much! They are such good travelers. Both ride in the van without any complaints. Maizie made a cd for all of us to enjoy on the long trip down to Florida. She is 11 years old now and so intelligent and sweet and athletic and all the things a parent could ever want to brag about. Yet, as I was listening to her cd, I started to laugh thinking about how I want to brag about how cool and eclectic her musical taste has become. Isn't that goofy of me? I just love music and I am so glad she "gets" it. I hope one day she gets horses the same way! Here are some of her Christmas gifts. 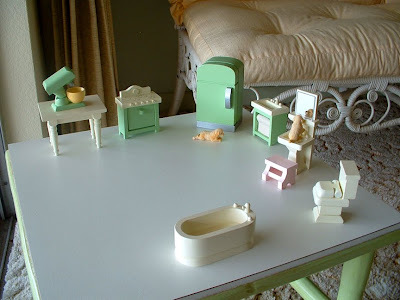 This adorable dollhouse furniture is from Pottery Barn Kids. Maizie doesn't have any dolls to fit - only animals. Isn't the puppy too cute? I rode a wonderful Thoroughbred mare named Red while I was here last year. You can read my December 2008 and January 2009 posts about her. I will probably visit Janet and Ted and Red and all my horsey friends here, but I am going to spend most of my time catching up with Maizie and Brian. They have been so kind to share me with Pie and Sovey this past year! Sounds like a lovely time!! Florida sounds wonderful, anything with sun! I hear you about the mud, ick. We are back to freezing cold again, but thankfully no snow this time. Maizie picked out some great tunes for the road! Michelle - It is a bit chilly, but better than at home! Maizie and I just went out in the kayaks and we were toasty by the time we returned. If it is sunny then we are ok. It is just the grey that we hate - we get enough of that at home. I can email you our number if you ever have time to visit. We always have time when we are down here! That is what I love about vacation - time! Rhinestone Cowboy!! That is the BEST! I love that seventies stuff so much, which is probably why I find your painting of the kitchen VERY INTRIGUEING! Your painting makes it look like an excellent little capsule! 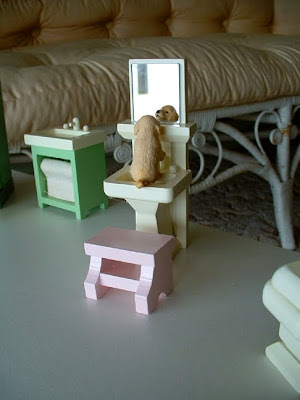 I also love those furnishings that Maizie got for christmas. I love small toys. I love Florida even though I know in places it can be a little rednecky. But you just can't beat all the sunshine! baystatebrumby - The funniest part about the Rhinestone Cowboy is that when Maizie was little I heard her singing that song up in her room. She was singing, "Like a LIMESTONE Cowboy"!!!!! We still crack up about that. I think ol' Glen Campbell and his 70's rhinestones would fit in perfectly in our time machine condo. How I wish I could visit my Florida family right now.... it is so cold and muddy here, too. My extended family has a citrus grove on the Indian River. (Itn.Costal Waterway.) We used to have a place on Cocoa Beach; sold a couple of years ago; and a house in Gainesville, sold about 10 years ago. Oh, I love the song Rhinestone Cowboy! In elementary school, I would sing it all the time! :) Your daughter is so darling and obviously has a great head on her shoulders. Does she like to ride at all? Anyway, I'm glad you escaped the snow and made it to sunny Florida for the holidays! Have a happy New Year!! LIMESTONE COWBOY!!!!!!!! That is sooo funny!!!!! Sounds like one inflexible cowboy!!!! Ah, burnt orange and avocado green. I do remember the 70s. I'm glad to see that some of the songs I grew up with are enjoyed by the younger generations. I see some on Maizie's list (love Shambala) My 15 year old stepson has recently discoverd vinyl records. He thinks it is the coolest thing to play records rather than his iPod. And he likes the ones I listened to 30 years ago. Glad you dug out and made it to Florida safely. Enjoy and Happy New Year! What beautiful pictures! Love the songs! Ha-Ha, Meme, I guess you do love the songs! YOU picked them! You are a "commenting" fool. what I want to know is are you kind?